We started by dividing into different groups. We had a lot of ideas and talked about what we wanted to do. Our main theme for the short film was suspense/horror, and we wanted to make the main character followed/chased by a other character. We began shooting in the public library. The first time we didn’t get much done, as there were lot of people there and we weren’t sure where we should start. We shot our first scene outside the library a couple of times, but later decided to shoot it again. Second time around things went a lot smoother and we actually managed to get something done. We found a room where we shot most of the film. The film was actually not supposed to have a humorous ending. Originally it was going to end with the main character dying by getting stabbed by the chaser. But we thought that it would be a little too generic and therefore we wanted to make a twist that would be surprising to viewers. I have to admit that making this wasn’t the easiest. We tried shooting from different angles without achieving a result we would be most satisfied with. Also we didn’t agree with each other the whole time and it lead to different complications. All in all we were all happy that we got it done. We learned how to work in a small group and in a crowded space. Even though we had our troubles we had fun! 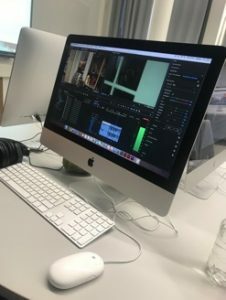 We had ideas on how to film some scenes on the final film we make in the end of this course. We started this idea based on the event venue. At first we had the idea to shoot this exercise in a cafe. The plot of the exercise changed during the planing. The venue was selected because we were planning the plot. At first we wanted to film a scene where the main character would spill her cafe all over a stranger. The idea of the plot changed but we started to build the new plot around the event venue of the first idea. We managed to film this exercise quite the way we wanted. When we were filming we had to change some ideas and some views. After receiving the task our group began to brainstorm ideas. We came up with a lot of promising visions but in the end decided to choose a simple but pompous situation for our project. Our vision was to capture the unexpected feeling of fear and being subdued in an unwanted situation. 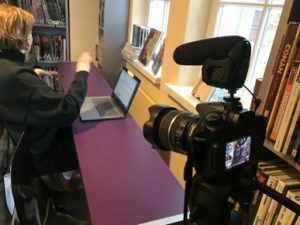 We didn’t need a lot of props and we filmed the material at our school, which made the filming easier. The short film is about a person fleeing a danger to a hallway. For a moment after locking the doors they think they’re safe but only to find out they’ve been cornered. We had fun making the film and it definitely was a learning experience about film making and situations. 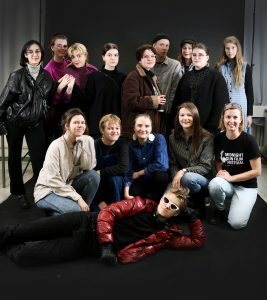 Hello, we are the students of Helsinki Upper Secondary School of Visual Arts (Helsingin kuvataidelukio). We are mostly second year students of ages between 17 and 18. We love cinema and movie making! In our school we have a large range of art courses. We are looking forward to apply our artistic talent in our final short film. We hope to meet you all in Paris next June! 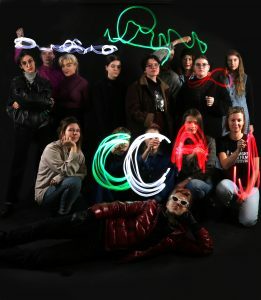 Light painting in our Open Workshop Day in January.